I grew up eating eggs every day. 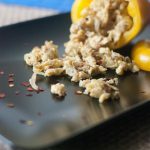 My momma makes my favorite scrambled eggs, which in the past I have had a hard time replicating the flavors of, though I'm not sure why. …I think I finally got it. 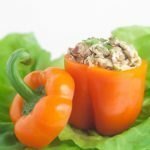 Egg Stuffed Bell Peppers are cute way to easily add some extra vegetables and make them look just a little fancier. Why? Because Holley and I have been so quiet the last few weeks. I could make excuses and tell you why, but… actually that's exactly what I'm going to do! As you may or may not know, I have been struggling with an old laptop which has been giving my problems for over a year. With no WiFi, error messages on the regular, and a screen which has made photo-editing a bit of a guessing game at times, this often causes me some stress and eats up a lot of time. That in combination with the fact that the excitement and momentum I started the year off with has been disappearing (mostly due to some gremlins affecting the website – you might have noticed that a number of the old posts are not displaying images). In fact, we just hit The Primal Desire's 2-year birthday. I was a little down that day, probably because I was up til the wee hours of the morning working on photos of The Primal Desire Chicken. My head was full of questions like “Are people even making our recipes?!”. I found out a day or two later that readers were unable to leave comments on the site. I've since fixed that. And I should have had this recipe for you last week, but somehow I lost track of time and thought it was for this week…. I blame the incredible weather that we've been having. I hope you too are enjoying an early spring/summer. I can tell you that Holley and I have been busy with great recipe creations and experiences. This past weekend we did a trial run putting on a catered dinner at a friend's house. This was not only tremendously fun, but we also created a number of fantastic recipes that we will be sharing in the near future! 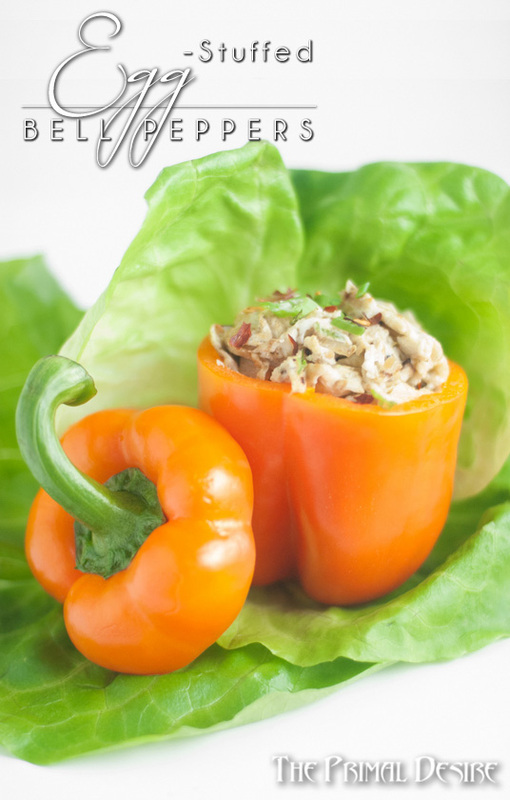 Let us know what you think about Egg Stuffed Bell Peppers and our other recipes. What has been your favorite? Wash and cut the top off of your pepper, and remove the insides. Saute onions in ghee on a cast-iron pan over medium to medium-high heat until translucent. Add chili peppers and after stirring add in eggs and salt. Stir while cooking until eggs are solid. 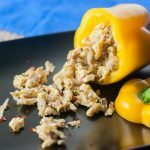 Remove from heat and fill pepper with eggs. 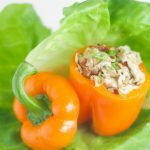 Sprinkle with green onion and enjoy! 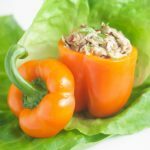 If you use different coloured peppers, it would make a really eye catching breakfast for guests! Thank you for the compliment about my scrambled eggs. I was telling your nephews this past week about your egg in a basket which I used to make for you pretty frequently, too. I should have made it for them with their gluten free bread, but we ran out of breakfasts for that week. Glad to see you back up and running! 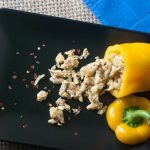 I use to make tuna stuffed peppers, but I love your idea of egg stuffed peppers! They are so good looking and so tasty! Computer and site trouble is so frustrating! Glad you’re up and running again. 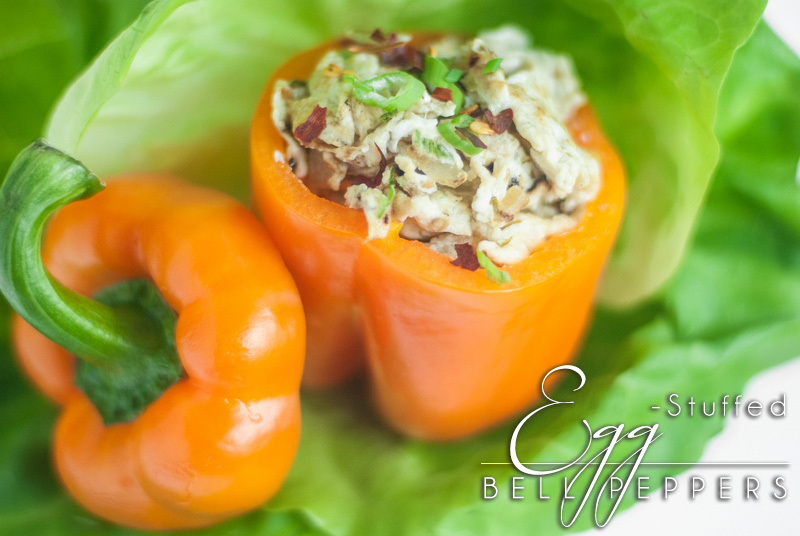 The egg stuffed bell peppers look delicious, perfect for lunch. Sure is. Thanks for the support Salma! Thank you for sharing this recipe. I’m glad to have been introduced to your website, as I’ve been looking for paleo recipes lately.